This is a re-post of an old article I wrote back in 2007, but I want to share it again. This has a video in it that you might not want to view at work, or if you have a weak stomach. The subject of death has fascinated me since a child, and the first time I remember grappling with the understanding of it and its implication was in ‘Short Circuit 2’. Although seemingly innocuous, it was the most disturbing film I had seen, but it also provided me with the ability to visually articulate the failure of an organic system in ways I didn’t grasp before. What I saw in that was that even through the immensely powerful nature of the consciousness, the sheer tangibility of my personality, the ego, I was made up of easily destructible organs and materials. The human body had lost a lot of the semi-magical qualities I had given it, and it left me feeling very frail and vulnerable. Sometimes I will look in the mirror, prod and poke all around my body, especially my face. Pulling back an eyelid reveals that I have an eyeball, connected by an optical nerve, and I can trace the bone around the teeth and gums. When I pull back my lips I see the unmistakable skeletal grimace, and I am suddenly reminded that I have bones, and blood, and flesh, and for all my illusions of indestructibility, I am in fact very vulnerable. Similar scenes from films have had the same effect on me. James Cameron’s movie ‘Terminator 2’ featured a T-101 cyborg, played by Arnold Schwarzenegger . The scene that affected me was the part where he is fighting the T-1000, a liquid metal robot who was seemingly invulnerable. The T-101 is skewered through the body by a iron pole and appears to be destroyed. However, after the T-1000 stalks off to find the Connors, our hero, the T-101 redirects circuits and locates an alternative power supply which gives him the energy he needs and allows him to save the day. Movies like this gave me a concept which lingers even today, of the human body as a machine, containing hundreds and thousands of inter-dependent components. They function tirelessly, on and on, responding to problems with collective intelligence. As one part fails, often others will pick up the slack to keep the pace. When multiple components fails simultaneously however, then the structure fails, but even as it does, the system is desperately working to bring energy where it is needed. 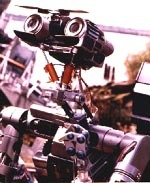 Just as the T-101 desperately tries to re-route power to it’s circuits after sustaining catastrophic damage, so does the the body perform similar functions, directing white blood cells to combat infection, clotting blood to seal up punctures into the body, increasing blood pressure or engaging organs into increased states to compensate for deficiencies. So through my life this is what I saw when I saw people die. Admittedly it was always on television and in films as I have never seen anyone die in real life, but all deaths even on screen invoked this incredibly powerful emotion and without my control, my imagination would kick in. When I saw someone suffer violent trauma, I would imagine it on this organic machine level; that the brain would be trying to re-engage the heart to keep pumping blood and oxygen to it, that the nerve cells would be returning signals of damaged nerve lines up and down the body. The heart would falter without the correct electrical stimulation from the brain, and then cease, blood in the veins would slow down and stop, and inexorably sections of the brain would begin to stop functioning. From the outside it may look peaceful, but inside the brain would be desperately trying to fix the problem, until at last the interior systems degenerate so much that all brain functioning stop, and the person dies. Below is film of an autopsy, and you do not want to view this on a weak stomach or if scenes like autopsy upsets you. I cannot stress that enough. I thought long and hard about posting this here for very obvious reasons and you might ask why I felt the need to post it at all. The reason I went ahead is because viewing it underlined my emotions about the fragility of human life, and for all the hopes and dream and personalities we have, we are but flesh and bone. This film was what inspired me to think about and therefore write about death. Viewing it to me is a liberating and painful experience, and hopefully it will be for you too, because I do not like to be reminded, inquisitiveness aside, of my physical make-up and yet I must not separate myself too far from my physical foundations. Arguably, that we come from such humble beginnings to stride the boundaries of conscious thought and scientific endeavor is astounding enough in itself. I think the link between man and animal, bird or fish is strongest at the level of survival. There is a desperation (there’s that word again) in the demeanor of every living being on the planet in those few seconds before life leaves them. Whether it’s in the eyes and body of a flopping fish, or the fear in the eyes of a wildebeest that is cornered by lions, or even the movement of cells in a dish, they all contain that instinct. This life is mine and you’re not going to take it from me. In humans it creates a fear at such a deep level of our consciousness that it is hardwired into every action we perform. We live this fear every day, and that’s why I’m so interested in it. There is the argument that we are perpetually dying, and also being rejuvenated, but I there is redoubtably the moment where homeostasis is disturbed beyond the point of a balance being able to be restored. To me the utterly fascinating aspect is the collective functioning of the body’s attributes to respond to these problems, often totally overriding lucid conscious thought in order to protect the organism from harm. Once again, the instinctual survival instinct is king above all else. We jump from a flame, adrenaline is pumped into our bloodstream to assist in the flight or fight responses, we raise our hands to protect us from danger, just as we flinch or blink for the same reason. I have always wondered what happens if we know we’re going to die. As the body physically struggles, does the brain consider the fact? Is every iota of energy thrown into survival or is there a point when the consciousness just knows it’s over, that you will no longer exist and there is nothing you can do to stop it. Is there a kind of peace at that point? As you all know, I’m not religious, but I can fully appreciate the appeal of religion to solve the difficult questions of the end of life. The most powerful force in mankind, survival, answered with the use of a little imagination. It makes sense to see people emotionally detach themselves from the immensity of the concept of death. I think that’s why young people tend to reject old people, as they embody the encroachment of death, and through that comes the destruction of the illusion we manufacture in our heads of some kind of invincibility. It’s barely discussed in our society, and yet in truth, it’s the only inevitability we can know. Imagine that you’ve only got five years to live. How would that change your daily actions? The impending nature of death through the gradual decay of old age raises separate questions. Is the knowledge of death a regular thought in the minds of those close to the end of life expectancy? How does it feel at seventy to know that there isn’t much time left, perhaps five years, maybe ten, with limitations on the tasks we’d like to perform due to the degenerative nature of the aging process. It must involve living with that understanding, day in, day out, the knowledge that that before long you will no longer be able to perceive the world around you. Realistically we can all accept that the fragility of our bodies are exposed every day through disease, injury and so on, but with age comes a sense inescapable inevitability. What kind of emotions does that create? I’m curious if any readers have encountered near death experiences, and what it felt like. Was the prospect of your demise faced with calmness, relaxed, or did instincts kick in for you to remove the body from danger? What went through your mind? How did it leave you feeling afterwards, and how has that affected your life since?